Harley A. Feinstein (drums). Harley Feinstein is born April 10, 1951, in Los Angeles, California USA. He grew up in West LA and Santa Monica and developed surfing culture. Harley studied drums in school and got his first drum set when he was 16. After the recording of Halfnelson's demo Lp, drummer John Mendelsohn was kicked out of Halfnelson and band's manager Mike Berns took the place. Mike Berns (who looked like a very cool Charles Manson) invested cash (he paid the costs for production of the demo) and spent time promoting the band. He could play the drums however he had a more relaxed/folksy style than Sparks required and so he was terminated as drummer after a brief amount of time. So few months later Harley Feinstein joined the band. Harley Feinstein came into contact with the Maels after Russell Mael responded to an ad that the drummer had placed in a music store called Ace Music in Santa Monica, California in order to find people to jam with. In 1970 Harley Feinstein was taking a bath one day and the damned phone in the kitchen started. This was in the days before telephone answering machines so Harley vacillated before finally jumping out of the tub to answer the phone. On the other end of the line was a fellow with a high voice, Russell Mael. Russ explained that they had this band Halfnelson which was without a drummer. They talked on the phone for around an hour and it was decided that Ron & Russell Mael and Earle Mankey would come over to Feinsteins house to audition Harley. The boys came over to Harleys house and Harleys mom brought out milk and cookies. After playing for a while, or so the story goes, Harley took his shirt off and he was in Halfnelson. Harley was far from an accomplished drummer at the time, having only jammed with friends before this meeting. But the Maels and Earle were not trying to be virtuosos nor did they desire a drummer who tried to be one. Over the next two years Halfnelson was signed to a recording contract, changed its name to Sparks, with Harley Feinstein as the drummer, recorded the first two albums. Also during this time period Sparks were sent to the UK by Bearsville Records for an extended stay of approximately six months. While in the UK and Europe Sparks played many clubs and concerts. They shared the bill with such bands as the Kinks and the then newly formed Electric Light Orchestra. The boys also performed on TV shows in The UK and Europe. There was a feeling that fame was just around the corner, especially after Sparks performed at a sold-out performance at the Marquee Club in December of 1972, but the record company (Bearsville) money ran out and the band returned to L.A.
Sparks began playing regular gigs at the Whisky A Gogo. This was great fun but a feeling developed that the band had lost its momentum. 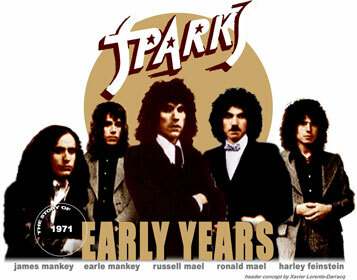 The members of Sparks missed the attention that had been lavished upon them in the UK and Europe. Ron and Russell Mael decided to return to the UK. They found a record company  Island  that offered to sign them, finance a move back to the UK. Earle & Jim Mankey and Harley Feinstein probably would have gone back to the UK but Island only wanted the Maels. After a considerable amount of soul searching Ron and Russ decided to accept Islands offer. They fired the manager (Roy Silver) terminated the record contract with Bearsville and go without the other band members. Ron and Russ went to the UK, found musicians, and recorded Kimono My House. In 1985 Harley Feinstein started his own firm in Beverly Hills then in 1989 he moved to Incinitas and relocated the practice to the San Diego area. In 2006 Harley Feinstein Harley reconnected with singer Thaddeus James Lowe and bass player Mark Tulin from The Electric Prunes. James Lowe had reformed the Electric Prunes and Harley was invited to record on the album. The Prunes' CD is called "Feedback" and Harley plays drums on the first two songs. Now Harley Feinstein is in a mostly covers band (with his wife, Michelle) called "Crash O'Malley" and he's also organizing a Brazillian Samba-style band called "Fejouada". Harley Feinstein is also in a rock combo with two English fellows (previously with "Circus in Reverse"), James Staton (bass and vocals) and guitarist Robert Antony. The band, called "Justice Fingers", Justice Fingers has just completed its first CD. Nota : These informations regarding Harley A. Feinstein were obtained directly from Harley Feinstein himself.